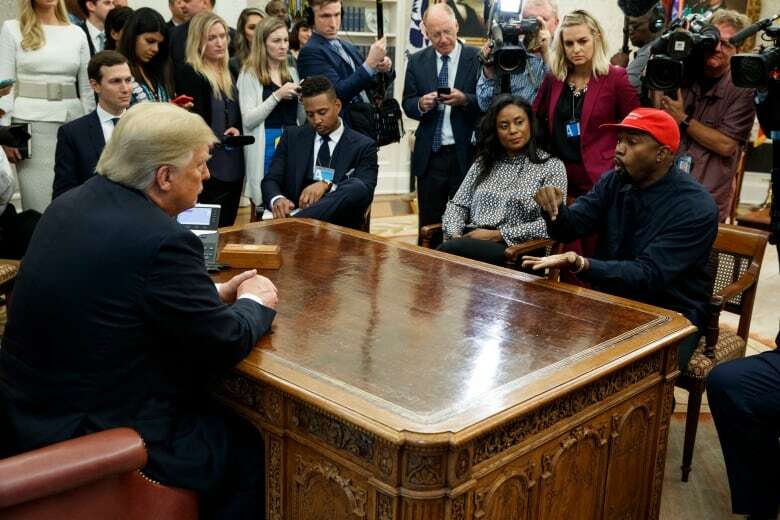 U.S. President Donald Trump and Kanye West spoke with reporters as they sat across from each other at the Resolute desk. West dominated the conversation with a series of monologues that touched on social policy, mental health, endorsement deals and his support for the president. The rapper didn't rap. 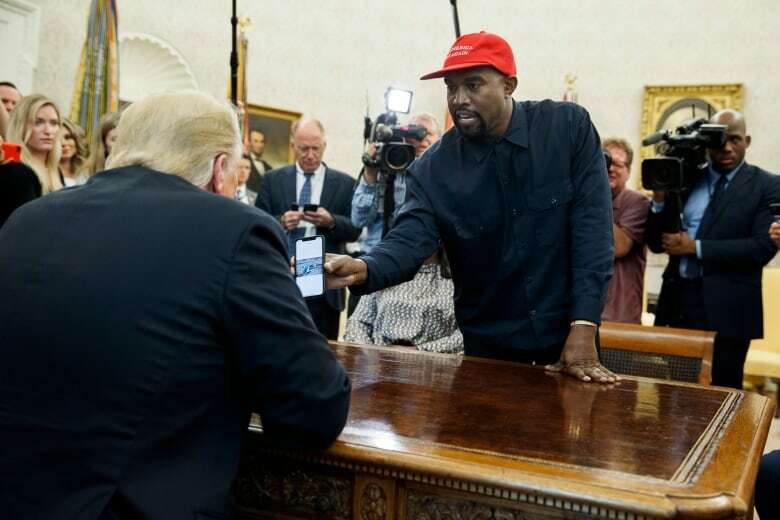 But seated across from U.S. President Donald Trump at the Resolute Desk, the musician delivered a rambling, multipart monologue Thursday that touched on social issues, hydrogen planes, mental health, endorsement deals, politics and so much more. Seizing the spotlight from the typically centre-stage president, West dropped the F-word, floated policy proposals, and went in for a hug. It was a surreal scene even by the standards of a nonconventional White House. The unlikely allies spoke to reporters before a closed-door lunch that had been billed as a forum to discuss policy issues including manufacturing, gangs, prison reform and violence in Chicago, where West grew up. Spectators at the show included Trump's son-in-law and top adviser, Jared Kushner, former NFL star Jim Brown, the attorney for a gang leader serving time in federal prison, and a gaggle of reporters. West's mental health has been a question of speculation since he was hospitalized in 2016. In a bizarre performance last month on Saturday Night Live he delivered an unscripted pro-Trump message after the credits rolled. From there, West discussed prison reform and violence in inner-city Chicago. He brought up Larry Hoover, the leader of the Gangster Disciples, who is serving a life sentence for murder, claiming: "The reason why they imprisoned him is because he started doing positive for the community. He started showing that he actually had power, he wasn't just one of a monolithic voice, that he could wrap people around." West later told reporters of his verbal stylings: "You are tasting a fine wine that has multiple notes to it. You better play 4D chess with me.… It's complex." Trump said they'd discuss the matter, and he'd keep an open mind. 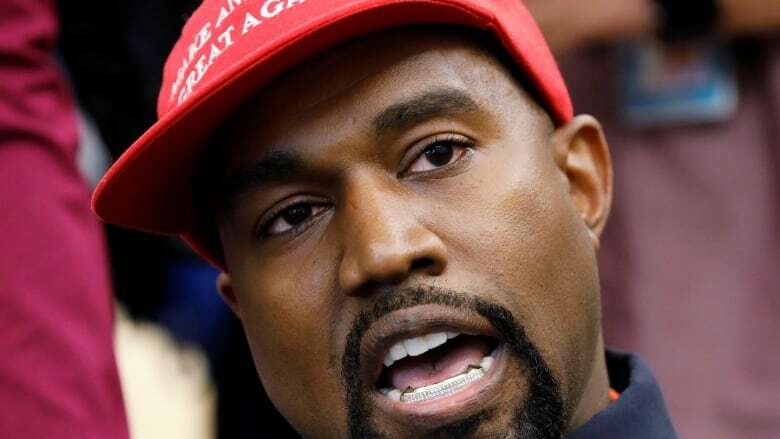 Asked about his comments in 2005 that President George W. Bush didn't "care about black people" after Hurricane Katrina, West said that "we need to care about all people" and that he "was programmed to think in a victimized mentality." "You don't have to agree with trump, but the mob can't make me not love him. We are both dragon energy. He is my brother," West wrote.